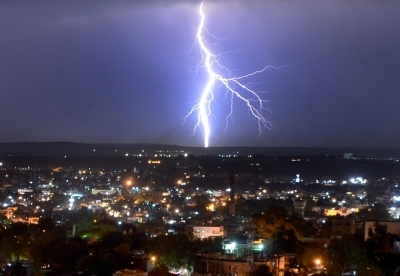 Vijayawada, May 14 (IANS) Five farmers were killed after being struck by lightning in Andhra Pradesh’s Anantapur district on Sunday, officials said. Three others were also injured in the incident which occurred in Kalugudu village in Gummagattu ‘mandal’ (block). The farmers had taken shelter in some huts under a tree during rains. In another incident, two cows died of lightening in the same district. Cabinet minister Kalva Srinivasulu, who hails from the district, rushed to the village. He directed officials to provide all help to the families of the victims and ensure best treatment of the injured.